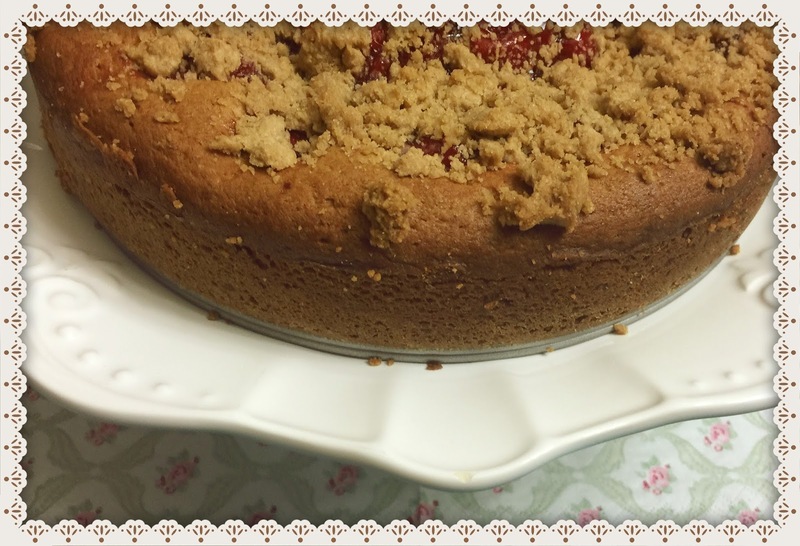 Cherry Coffee Cake with Streusel Topping for German Themed Book Club Pick ! Gentle Readers of my blog might be familiar with the fact that yours truly runs a local book club . We meet once a month , discuss the chosen book a "little" and gorge on super yummy food a "lot". The latter is due to the fact that all members are such talented cooks as well as being ardent book lovers. Though , we might not admit it outright but the call of the food at the meeting is more than the lure of our current read . Well, to be fair , we all love books without question but I guess we are even bigger foodies. As luck would have it , our members come from diverse parts of India so our book club food boasts of having the finest culinary treats from each region .Yes, we are blessed that way . Tempted to join our book club ? I hope you read the part where I mentioned that it was "local".So, unless you reside somewhere in the Research Triangle Area , the chances of joining it are negligible . I would strongly encourage you to start your own and fervently pray that the members are united by the love of food as well as books. The above pic is from (I think you must have guessed by now) our meeting where I decided to make cherry coffee cake with streusel topping in keeping with the German theme of our current read "the Book Thief ". For those unfamiliar with streusel , let me enlighten you . The word itself means "to sprinkle" and refers to the crumb topping , the kind you see even in the pictured cake.The topping is made by mixing soft butter, sugar and butter with a hint of cinnamon and is strewn on top of the cake or any rich pastry product. Though it is called cherry coffee cake, the coffee is missing from the ingredient list . Coffee cake is a general term for a cake served along with tea /coffee and having a streusel topping. The streusel might be in form of a swirl and the cake itself might have a filling of fruit and nuts.I decided to do away with the nuts because I was filling them with cherry fruit which in my opinion tastes divine on its own. The fruit filling came in form of a can which can be purchased from the super market as pie filling. In a bowl, sift the dry ingredients ( 1 3/4 cups flour, 2 teaspoons baking powder, and 1 teaspoon cinnamon) and set aside. In another bowl, mix 5 tablespoons butter, 3/4 cup sugar, until creamy, with the help of an electric mixer on high speed. Now blend in the eggs one at a time along with the vanilla. With the help of a spatula, fold in the flour mixture alternating with the cream until well combined. Transfer the batter into the greased pan making a well for the cherries. Now carefully spoon the cherry filling over the batter. Keep it baking in the oven for about 40 minutes. Meanwhile, we'll move on to making the streusel. In a bowl combine the remaining 1/2 cup flour, sugar, butter, and cinnamon until it has a crumbly texture. After the 40 minutes take the cake pan out of the oven and sprinkle the streusel on top. Bake for another 20 minutes and check for doneness by inserting a toothpick in the middle of the cake and checking if it comes out clean. Enjoy it hot preferably in the company of loved ones or friends.